The price of the Samsung Galaxy S 4G is about the last bit of information we need concerning the launch of this device. 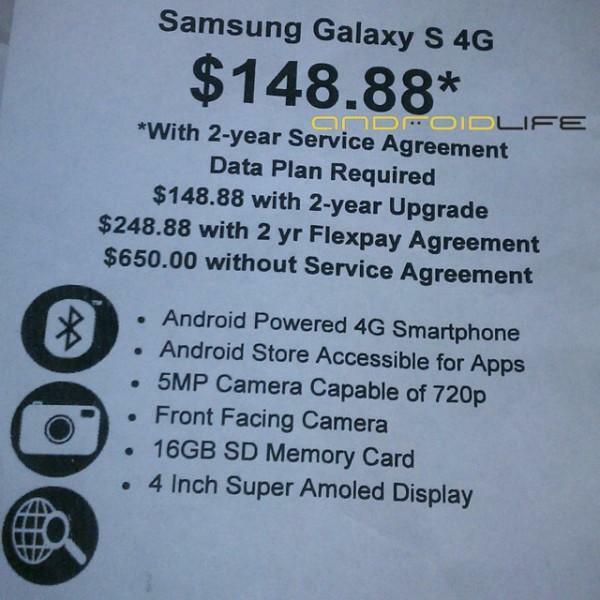 While we emphasize that Walmart prices don’t usually fall in line with T-Mobile corporate retail pricing, this leaked price sheet obtained by AndroidLife shows that the Galaxy S 4G will be offered at a price of $148.88 on both new and qualified upgrade accounts. It’s definitely an attractive price for the first 21Mbps capable device in the T-Mobile arsenal but we again emphasize that it’s likely that Walmart pricing won’t reflect T-Mobile’s own pricing. $650 off contract – yikes! Makes me a little scared to see what the better specs phones coming soon, will be off contract. In my research walmart has had better prices then the t-mobile store. Fo rthe current Vibrant walmart here (College Station, TX) has it for 50 while t-mobile store here is 100 for upgrade price. You think 650 is bad? You should see what they charge for some of their Verizon devices off-contract. IIRC the Droid X cracked the 700 mark with room to spare. And lets be honest… WalMart isn’t interested in selling phones, they want to sell paper. Holy moley! This is definitely a deterrent for the Even More Plus subscribers like me. And people wonder why dealers have their own ETF! This phone will more than likely be $199.99 on contract, and $499 off contract with T-Mobile. They can not afford to put the price too high, and its already sad they are releasing the ‘same’ phone with a new name. Anyway, I’m hoping we get a 4.3 or 4.5 inch screen on an Android phone soon. Everyone else is in the coming months. Come on TMo, step it up. Still going to wait for the HTC Pyramid or the LG dual core to make it to market. I have to wait until June anyway like the rest of the early MT3G adopter who bought with 2 year contract. MT3G is sooooooooo slooooooooow. This is NOT the T-Mobile price. Walmart has a G2 and a MT4G listed at $549.99 off contract so expect this SGS4G to cost $549.99 off contract at TMOBILE. Shame on you David for standing by Walmart’s gross markup! I hope everybody’s braced themselves for the G-Slate’s price tag!? I think he was referring to the on contract price. Oh yeah that would be attractive. I’m better it’ll be $499 off contract. If you notice none of the high-end T-Mobile Android Smartphones are over $499.99, & since this is with the current technology rate times, it’s perfectly set to be $499 off contract. Just watch.. Either the Vibrant will drop by $50-100 and the 4G takes its place at $500 or the 4G will be milking it at $550. They need to EOL the Vibrant soon so a huge price drop is more likely if they’re smart. I agree as we at tmo have never has a phone cost more than 500. I would be dumbfounded if it does cost that much. 650 off contract is comical. Why? The iPhone off contract was the same price, and its not even a 4g phone. AND its 4 years old. Whats comical is that people like you think that this technology should come for pennies. If you dont want the contract, be prepared to pay a premium price. Never mind the fact that the network will not support more than 5M. Then you should be seeing at least 10M. You do realize that the Vibrant sees the same speed! And that the 9700 sees about 5 as well using Opera Mini or BOLT. You are seing HSPA not HSPA+. Its a scam. There is no backhaul. So its like having a walkie talkie conversation with the other guy using a can! Hey, Tmoisslow; read your posts. Please post back your findings. Interesting how you see the same 5M on your G2 as is stated above. The dots are connecting here. Some nice comments down there. Nexus Crazy Eddy is right. Why G2 or Nexus S whichever you have will more than be sufficient. The software for PC’s with dual cores took over a year to make a splash. I took the advise here and got myself a Clear modem and moved over to the G2 from my BB. Will report back. So far, the speed on the phone is better than the USB Rocket 2.0. 4-5M. I am happy for a phone; not a stick. BUT, to be fair; Clear will not give you that speed either. They promise 3-6 with spikes to 10. However, there is no 4G cap. Again, to be fair, I could have bought two sticks I guess and been good with 10G but that is insane. Now I have network redundancy. Will report back as to speeds etc. I know folks have perceived otherwise, but I am a Magenta guy; just do not like false advertising. It will be interesting to see what the lg tab looks like in real time. With my proposed set-up, I won’t need another data plan. OR I could go the Ipod touch VOIP option in June and have my iPhone and my G2! Network peak (for HSPA+ markets) is 21, not 14. The phones (G2, and MT4G) have internal limits at 14, and most others (Vibrant, MTS, blah blah blah) are limited internally at 7. The phones do not communicate differently, some just have higher limits. If you are in an area where backhaul/network traffic limit speed to <7mbps then you will see no difference. If you, on the other hand, live in an area in which the network is able to hit higher speeds like me (Milwaukee) you will see the Vibrants (etc.) peak around 6-7, and the faster phones go higher (I've gotten into the upper 11's in MKE on my G2). As T-Mobile continues to roll out the new 42mbps standard, you will see the phones hit their peak internal limits more often. The network will support up to 14.4, but for various reasons you don’t get that in real life. According to TMobile engineering folks I’ve spoken to, the older phones will be able to come closer to the 14.4 theoretical max as the new 21mbps network is rolled out, and the newer phones will be able to take advantage of speeds above 14.4mbps. Yeah, and they are going to offer Rocket 3.0 stick that will go to 42! Which will be 5 until they put in some backhaul. Wirefly and Amazon tend to have the T-Mobile stores beat hands-down on price. See here for price comparison: http://www.techlicious.com/tip/how-to-save-tons-of-money-when-buying-a-cell-phone/. What you are quoting is standard fare for authorized dealers, including Wirefly.com, Amazon.com and WalMart.com. If they didn’t have this term, then people could flip the phones at a profit on ebay all day long. The data plan is required by T-Mobile. The ETF is irrelevant if you plan to honor your contract. Modifying is allowed. Canceling is not. I got my current Vibrant from Wirefly.com and loved their service. so 150$ for 4G and a FFC? Walmart doesn’t mark any phone up. The retail price is the retail price. The perk to upgrade with Walmart (and I’m sure other places too) is you get your rebates upfront. This is the reason why the phones are so cheat to renew on a 2 year contract. If you buy the phone outright, you pay the retail. I work at Walmart in the Connection Center so I know this. I also know that the price tag shown is very pre-mature as the system can update and the price could go up or down. That price does seem about right however. Since when does Walmart come w/ an additional ETF? I’ve never had to worry about an additional ETF w/ Wally World. The walmarts and best buys always mark up retail pricing because of their commission structure. They get paid a lot of money from any carrier when they secure contracts. 3rd party retailers never get hit with deacts either. So, by lowering the contract price than the corporate store, they attract more 2 year customers and send the crap customers across the street to waste the retail employees time. lol @ Retailers not getting charged back for deact. It does not have any extra ETFs. That’s only if you buy it online, through Walmart’s “let’s Talk” thingie. Get it right. I spoke to a tech guy and he said that some of his higher authority people and he said that they spoke of a small possibility that they will have some sort of trade in deal with the vibrant. Again this is a small tiny unconfirmed rumor but sounds interesting. I really hope this is the case. Vibrant is less than a year old and then y’all turn around and put out a new and improved version of it ?! WTF ! While this trade in deal may be legit, I’d bet good money they’re gonna require an agreement renewal to take advantage of it. Please TmoNews, keep us up to date on this topic. Thanks. Hmmm I would not trade my Vibrant for this. It’s only got 2gb internal, plus a 16gb sd card. I regularly get 6mbps and I’m okay with that. I don’t want an FFC. Sounds hard to believe but in a way it might make sense. If tmobile can keep some customers on contract who were considering to leave over the vibrant deal. I swore off samsung but for a proper working gps, less buggy froyo and if the lag is fixed I might consider it for a reasonable restock fee. All the exchanged vibrants could be free open box deals for people who want an entry level smart phone on the cheap. So its a win win bring in new contracts & keep the legacy customers satisfied. I won’t expect this to happen but it would be nice in my case someone who has been faithful to tmobile since the 90s. I agree with you good sir and Charlotte to each their own. I would love a FFC and guaranteed 4G access. it’s running on android 2.2 and you are saying NO FLASH….mytouch got flash in 2.2 and why don’t this?? Noobtube is refering to camera flsh bro. No 1080p recording/viewing, no HDMI out, no camera flash, , no DLNA, no UMA, no tethering, no hotspot capability, ONLY 1gb built in memory (don’t let that 16gb microsd card fool you), Lastly- NO dual core processor! No way Samsung! Agreed on the 1080p, HDMI, and Flash. However, Samsung AllShare provides DLNA support. UMA is provided in the 2.2 build of Android provided by T-Mobile. It’s a client application providing WiFi calling. I have it on my 2.2 Vibrant. Hotspot capability is a carrier choice as 2.2 supports it. And typically, Samsung has provided 16GB of flash for internal storage PLUS extra microSD card capability. My vibrant has a total of 48GB (16GB internal and a 23GB microSDHC card). @Deej- I didn’t know Samsung AllShare was DLNA , my bad. However, I read the specs of the phone on the link below and it doesn’t have 16gb built in, its thru a memory card, the actual internal built in memory is a measly 1gb. Woo Hoo another high end smartphone jam packed with bloatware. With the exception of HSPA+ and the FFC, this is what the Vibrant should have been 4 months ago with timely updates. So im guessing Samsung finds it easier and cheaper to make new phones instead of putting time and money into developing a more stable delivery system for Software updates. If you buy one of these phones, be prepared to be stuck with Froyo for at least six months. Hopefully you smoke a lot of pot so you can watch Inception twice a week and still have it blow your mind. Wirefly.com just announced pre-orders for this phone starting tonight at midnight PST.